Whether you want to design your bouquet yourself, or you plan to have it made for you, you’ll definitely want to know what your options are. After all, you’re not the only one carrying a bouquet! Cascade: Every bride has seen or at least heard of this bouquet style! The cascade is a round of flowers trailing into a long, thin V-shape at the front. The length of the cascade can vary, from just long enough to cover the hands to reaching as far down as the floor. Nosegay: A nosegay is a small, compact bouquet that usually consists of one type of flower with no greenery between the blooms. Hand-Tied: The hand-tied consists of a cluster of flowers tied at the stems, usually with the exposed stems showing beneath the point where they are held. 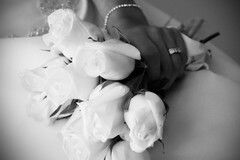 This is a very contemporary styled bouquet used in many weddings today. Round: The round is a more traditional bouquet made up of flowers, greenery, and filler with no trailing elements. Rounds can also be made of just flowers and filler, with no greenery, or of a single type of flower, like a cluster of roses for a more contemporary look. Presentation: The presentation bouquet (also called an arm bouquet or arm sheaf) is usually made of long-stemmed flowers that are held in the crook of the arm. It’s not very traditional, but it can look beautiful. Tussy-Mussy: A Victorian-style bouquet in that accentuates a decorative holder. Generally, the holder is made of metal (and might very well be antique), and the bouquet is designed to show the holder rather than trail in front and cover it. Now you’re all set! Head out to the florist of your choice and impress everyone with your extensive knowledge about flower arrangements while you pick out the perfect bouquet for you! My bouquet was round, I think that’s what it would be considered…lol but it was beautiful, I think they all are gorgeous, they smell and look amazing.